So I was flipping through Linked In recently when I ran across a Jeff Bezos interview on CNBC from 1999. Twenty years later, Amazon is one of the top retail companies in America, if not the world. Amazon.com has redefined commerce in America, for the good and the bad. Before Amazon became a household term, though, there were lots of questions circling around the legitimacy of Jeff Bezos and how he was handling Amazon, and the whole idea of Internet commerce. I love this interview, not for the historical value (I was a college senior when this came out), but because twenty years later Jeff Bezos' answers are applicable to the Church and their wrestling with Church Online. "If there's one thing Amazon.com is about, it's obsessive attention to the customer experience, end-to-end." So, in 1999 Jeff Bezos defined what Amazon would obsess over, and it's that pinpoint clarity that made Amazon the retail giant it is today. For Amazon, the goal is the customer experience. So, church, what is the one thing we obsess about? Salvations? Discipleship? Weekend Services? Being "right" when the world thinks we're wrong? How often does what we say we obsess over really match what we're obsessing over? John 15:5-6 // I am the vine; you are the branches. If you remain in me and I in you, you will bear much fruit; apart from me you can do nothing. While I don't necessarily want to get into the Salvation/Discipleship battle, we can obviously take away from John 15 the visual of "remaining" in God. There's a length of time involved, And, to that end, I don't think anyone in Church can disagree that God desires a lengthy-relationship with us. The goal of church is not a one-hit wonder, but develop an ongoing relationship with people. But Church Online is known to create consumers... Online attenders are perceived as one-hit wonders, not as people interested in legitimate ministry. How do we combat this? "It doesn't matter to me if we're a pure 'Internet' player. What matters to me is we provide the best customer service. Internet, sminternet. That doesn't matter." While the dotcom era was built and fell in the early 2000s, Amazon.com was smart enough to know that it took both digital and physical realities to properly provide customer service in the changing landscape. In 1999 it was trendy to be a dotcom only, but realization came that dotcoms were sometimes hollow, and needed physical structure in place to best serve the people? It's incredibly ironic that the interviewer is drilling into Jeff Bezos about being an "Internet-only" company, and Jeff's reply, simply put, is that we're all about customer service. Once again, not wanting to get into the salvation/discipleship battle, but what I like about Amazon is they used whatever tool necessary to provide the best experience for their customers. Church, legitimately ask yourself this question: What if we allowed God to use Online for His glory? What if we built relationships with people online, using online to share faith? What if we created disciples, online? What if we used Online to create opportunities of discipleship and biblical community? Matthew 28:19-20 // Therefore go and make disciples of all nations, baptizing them in the name of the Father and of the Son and of the Holy Spirit, and teaching them to obey everything I have commanded you. And surely I am with you always, to the very end of the age. ...half a dozen distribution centers around the country, allows us to get product in front of our customers... which improves customer service levels. Church Online, here's your answer. How do you effectively manage a ministry that can effectively get very large, very quickly? How do you create disciples in virtual spaces? By creating community for people in isolation. By making the hero of your church NOT the Pastor, but the person willing to share their faith... willing to disciple. I love this Instagram Post by Ryan Sharp, Church Online Life Groups Pastor at Life.church. We could go on talking about Life.church, and how they're utilizing online well. (I love their motto: anything short of sin to reach people for Christ!) But one of the big takeaways is in order to effectively manage, reach, disciple a big ministry... we need to think small. 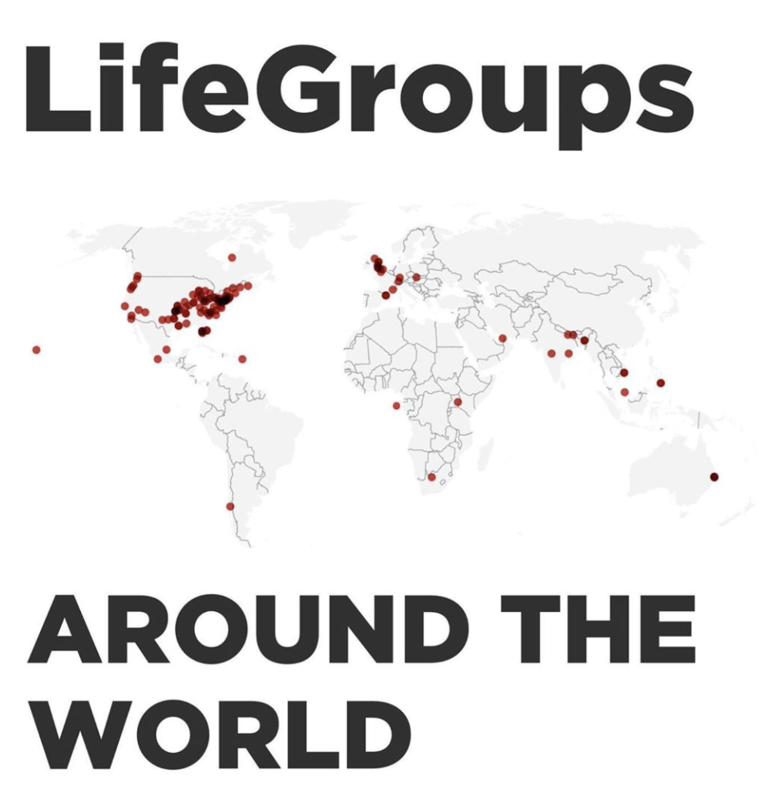 The dots are Life Groups scattered around the world. These are lives being impacted, changed, discipled. What I see here is Online Discipleship being used. I see lives being changed not just by watching a video, but by empowering volunteers, lay people, anyone and everyone with the Gospel. Suddenly, an effective Church Online doesn't just exist in digitally. It exists physically... and is stretching the church beyond its established geographical boundaries. In 1999, not many people thought Jeff Bezos could build a retail company. Twenty years later, Amazon is prime (pun intended) to continue on changing the world in big ways. Church, we have an opportunity to impact the world in new ways... we just need to use some different tools in our toolbox.